The Earthdata Code Collaborative (ECC) is a platform for development, testing, and discovery of Earthdata-related applications and services. Writing code is hard, but testing code is even harder. What framework should you use? What types of tests should you write? And most importantly, how can you ensure those tests are run consistently? The ECC provides a ready-to-use framework for running your tests every time your code base changes, alerting your team of failures, and even makes recommendations about what testing frameworks and approaches to use. Bug tracking, collaboration, and managing code changes are essential to a strong application development process. Through integration with Atlassian Jira, Confluence, Bitbucket, and Bamboo, you can quickly track and squash bugs, enable communication among your team, and do it all in a way that feels natural and lightweight. On top of that, Bitbucket provides your team complete control over your code changes and even makes it easy for non-team members to submit patches and pull requests. All the tools in the world can't replace inspiration and good ideas. Sometimes looking at another solid project is just what you need to kickstart your own development thinking. The ECC provides the ability to browse other public projects, including taking a look at their code base and running application. Get ideas, integrate other code bases into your project, and fix a bug while you're at it... all using the tools you're already familiar with from your own project. The first thing you'll need is an Earthdata Login account. If you don't have one already, head to https://urs.earthdata.nasa.gov/ and register. You'll get an account activation link via email; once you've activated your account, you're ready to request ECC access. Go to https://ecc.earthdata.nasa.gov/ and sign in. Once you're logged in, you'll see a "Request Access" button; click that and fill out the form with the name of your project, your NASA sponsor, and any additional information you have about your request. Once your access request has been approved, you'll receive an "Access Granted" email from our support system. 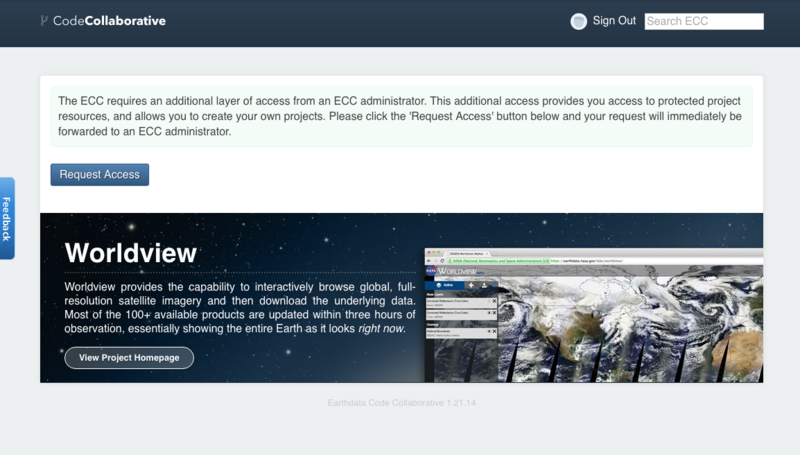 If you have any issues getting ECC access, contact our support team by using the "Feedback" button on the side of the screen, or submit a ticket at the Earthdata Service Desk, and a support representative will help you get the access you need. Here you can fill out basic project information. 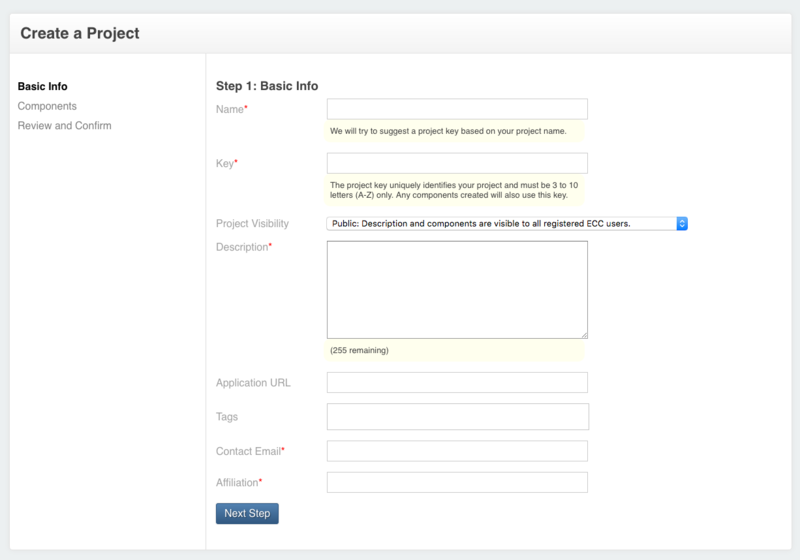 Public visibility is ideal for most projects, as it lets other ECC users find your project and collaborate with you, but there are options to restrict access further if you need them. If you're not sure what level of Project Visibility you should use, get in touch with our support team at support@earthdata.nasa.gov to discuss your particular project requirements. If you're not sure which of these you're going to need, you can leave all of them selected; this will give you a JIRA project for ticket tracking, a Stash/Bitbucket repository to store your source code, and a Confluence wiki space for collaboration and documentation. On the next page, you can confirm that everything's been entered correctly, then click "Create Project" to spin up all the tools for your application. And that's it! You can now use the blue icons on the top right to navigate to your source code, wiki, and ticket tracking. Have fun!